Kalani Pe’a is sharing his Hawaiian heritage with the world in the most wonderful way. Blessed with a beautiful, soulful tenor, the LGBTQ recording artist (and published author) was diagnosed with a speech impediment at the age of four. Pe’a’s parents, both musicians, introduced him to the world of music, and it quickly became his therapy. 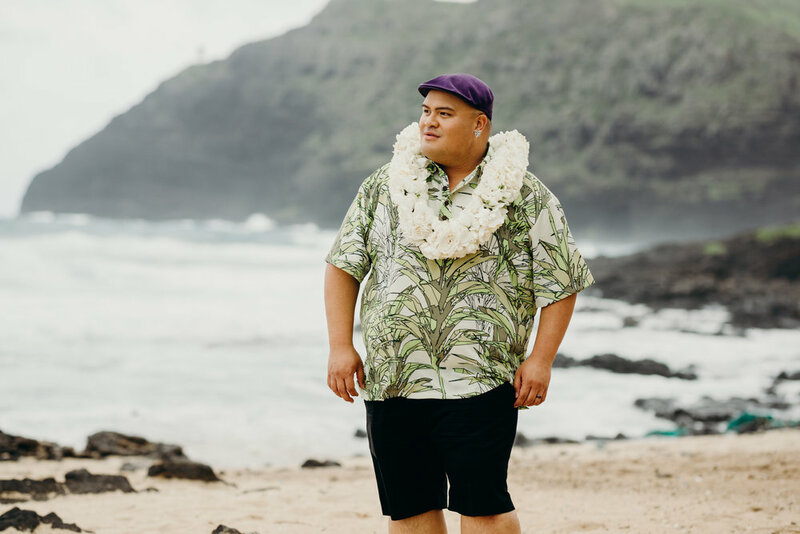 Pe’a recently released his album No ‘Ane’i, the follow up to his 2017 Grammy-winning debut album E Walea. The collection features eight original tracks and four classic hits, including a stunning cover of The Carpenters’ 1969 hit “Superstar,” and has been nominated for a Grammy this year in the Best Regional Roots Album category. We talked to Kalani all about his 2019 Grammy nomination, tour life, and more. Check out the interview below. MNGBlog: Congratulations on your Grammy nomination! What does this album, No 'Ane'i, represent for you? Kalani Pe’a: No ‘Ane’i means We Belong Here. I wanted my sophomore album to focus on allowing people to know their gift and talent. I wanted people to embrace their skills and share it to the world. Each and everyone of us are prominent and profound resources for the communities we serve. The songs I composed and co-composed in No Ane’i talks about people I love, places I love, cherished Hawaiian royalty, Hawaiian natural and cultural resources, etc. My music defines who I am as a Modern Hawaiian. I want to ensure that people can make a personal connection to my music and share their personal story. The foundation of Hawaiian cultural values and practices start from home. MNGBlog: What do you hope people take away from the album after listening? KP: My music shapes the identity of the Hawaiian people. I want to inform non-Hawaiians as well the importance of our music and how our music and lyrics defines and describes who we are as Hawaiians. You can come to Hawaii and listen to a variety of music- Hawaiian, island music, Hawaiian/Contemporary, Soul music and much more. I want you to understand that I am a Hawaiian/Soul artist and not the typical traditional artist. I am all about pushing the envelope, being innovative and creative as a music creator. MNGBlog: What does it mean for you to be representing Hawaii around the world in such an amazing way? KP: I am just a vessel representing my ancestors and forefathers on this journey. I come from a line of musicians. I am holding the torch that was carried by thousands of generations before me. It is my duty to share the Hawaiian language and culture through my music. Becoming a Grammy winner has allowed me to share my music to the people of the world and collaborate with people all over the world. Being a Grammy winner gave me an opportunity to share my music to people across the US, Japan, Europe, South America, etc while also learning about their music of their own heritage. I am blessed, and that is my objective- perpetuate the Hawaiian language and take our music on a global platform. MNGBlog: What has been your favorite part of the tour? What has been your favorite stop and why? What stop are you looking forward to? KP: I love the fact that when we travel by van we can see the weather changes and the views that are just so stunning. We can go from a sunny area to the snow if we’re traveling in the winter. The climate changes is absolutely beautiful. I also look forward to eating all kinds of “healthy” food. I often buy Blue Star or Voo-doo Donuts for my family and band. I love to eat all types of steaks and drink all types of cold brew coffee. Allan and I love walking into coffee shops across California, Oregon or Japan and find coffee shops hidden in alleys. I love to snack on delicious food. The most memorable part of my tour is getting on a train and looking out into the beautiful wilderness, the outdoor life, the weather and much more. On breaks, I often take an uber to different coffee shops and then head to vinyl and CD shops. I love buying vinyls. Also, I’m addicted to purple. I love to buy purple socks, too. I am looking forward to the US- Music for the Soul Tour 2019 and I look forward to performing in Flagstaff just to see my baby brother and his family. I am looking forward to performing in Phoenix for the first time and ending my tour in LA. I have a seven city tour and they’re all unique in so many ways. MNGBlog: What are you most looking forward to in 2019? KP: Building more working relationships with people in Music, Business and Marketing. I look forward to touring to more new places and performing across the U.S, Japan and hopefully plan on a concert in Alaska and the Carnegie Hall in NY. I look forward to performing in Europe as well. I am excited for my full tour as well (more U.S. tours and Japan tours.) I look forward to a healthy start of 2019 by watching what I consume during tours and catching up with rest. I have been on the go for three years. I just want a vacation in Tahiti and buy a bunch of Tahitian pearls this year. I want to make Tahitian pearl necklaces, sing Hawaiian and Tahitian music on my days off, under the coconut tree half naked near the beach and BREATHE while enjoying my man dance hula for me. When will I get this? Hopefully soon!